Are you ready to get "shamrocked"? 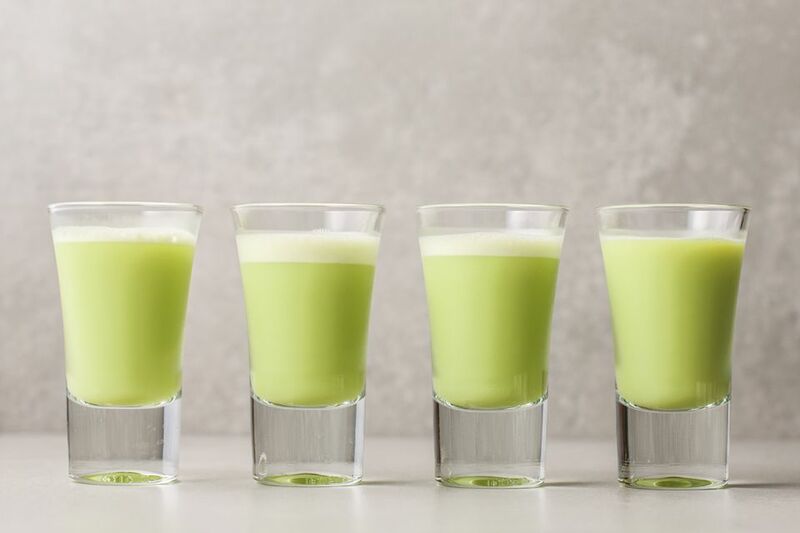 This easy green mix is a fantastic shot for St. Patrick's day and it's utterly delicious. It holds a light, fruity flavor against a cream background and, of course, there's a little Irish whiskey tossed into the mix. This Tullamore Dew recipe relies more on Midori than the Irish whiskey and that creates a smooth, sweet (but not too sweet) shot that anyone can enjoy. The shooter goes down very easily and doesn't leave you feeling like you've just had a shot. Once mixed, the recipe will produce a volume around 3 1/2 ounces, which should fill two average-sized shot glasses with a little left over. You can easily double the recipe and shake up four shots in a single shaker. The recommended brands of liquor are great suggestions, though there are many nice options for each that you can explore as well. For instance, Baileys is a very popular Irish cream, Bols makes an electric green melon liqueur that rivals Midori, and Jameson is always a nice choice for Irish whiskey drinks. Make the shot just a little smoother by serving it in frosty shot glasses. Keep a few in the freezer so they're always ready when you want to mix up a drink. This shot is almost too good to drink in one gulp! Savor the creamy taste by straining it into a chilled cocktail glass for a beautiful green martini-style drink. It's also a delicious sipper when served on the rocks in an old-fashioned glass. In this case, pouring a full shot (1 1/2 ounces) of whiskey is a great idea! Substitute the Irish cream with RumChata if you like. The shot will retain the rich creaminess and the taste will be nearly identical. Not a fan of whiskey? Try the shooter with brandy, rum, or vodka. You may be losing one "Irish" ingredient, but the green color will still fit the St. Patrick's Day theme perfectly. How Strong Is a Shamrocked Shot? This shot tastes really good, but it's also pretty strong because it's made entirely of liquor. While it will vary depending on the spirits you pour, the shamrocked should have an alcohol content in the 22 percent ABV (44 proof) range. It's not the strongest shot you can drink, but it's also not the lightest. Keep that in mind so you don't get drunker than you intend.